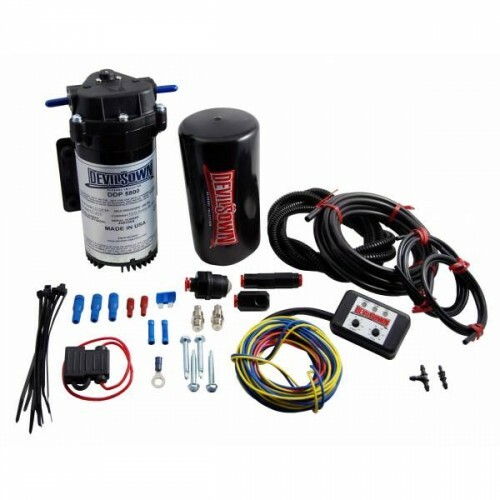 This kit is designed for all turbo/supercharged petrol or diesel vehicles, looking to Decrease DET & intake charge temperatures yet maintain or Increase BHP figures. These kits have been proven time and time again in street, race and drag applications. The kit contains all the components needed yet provides a simple and straight forward installation that doesn’t require you to be a mastermind mechanic or tuner to fit. These kits are by far the best available! Don’t buy a knock-of brand kit with cheap parts for you beloved car, unlike many other brands the Devils pump (Shurflo 8030 series) can run 100% methanol or alcohol as it's chemical resistant or run dry without getting damaged with its EPDM /Nylon valves, Santoprene diaphragm, and adjustable peek pressure from 150 to 300psi. It can also prime itself up to 8ft, so unlike others it doesn’t have to be gravity feed making a lot easier to mount, very handy when space is an issue. This kit only uses the highest quality parts. This kit utilizes a PROGRESSIVE CONTROLLER for activation, it reads the signal from a built in 3 Bar map sensor which converts boost into an electrical signal, allowing the user for an example to say start flow at 15% @10psi and then ramp the flow upto 100% by 25psi allowing you to create a very linear flow which inturn will create a smooth power/torque graph. This kit will fit any supercharged or turbocharged petrol or diesel engine etc. If you have any question please don't hesitate to ask & worldwide shipping available through our shop. This pressure gauge kit comes ready to attach to all systems with 1/4" tubing, It is helpful in moni..